I travel without a smart phone. In fact, with the exception of my own organic and home-grown brain, I travel without a smart device of any kind. Oh, I have considered getting a tablet for use on bike tours and for just fooling around with at home. But then I am in a restaurant, a bar, at a picnic or in a state park and I see folks tethered to their electronics, engaging with the screen and ignoring their family, companion, spectacular scenery…well, I’m reluctant to join those ranks. And so, instead, I go to the library. Did you know that there are more libraries in the U.S. (thank goodness) than there are McDonald’s or Starbuck’s restaurants? 96% of Americans are served by a local library. This translates into the fact that everywhere so far that I have bike-toured I’ve been able to access my email, use the restroom, find or trade a free paperback, ask directions, update my Facebook page and this blog, get a restaurant or campground recommendation from a local–well, you get the picture. Instead of querying Siri I am of necessity approaching a friendly face, excited by the possibility of making a new friend. This, for me, is almost the entire point of travelling by bicycle in the first place. If for some it is all about the journey, for me it is all about the folks I meet along the journey; down the Mississippi, riding Fairbanks to Anchorage, my life in general. Cycle touring is by its very nature a rather solitary pastime, even when you do it with friends. We all ride at a different pace, and there are few places where it’s really safe or considerate to ride two abreast. On long tours I usually go hours at a stretch without much interaction with my fellow travellers. Thank you, local governments, for the havens that are your libraries. 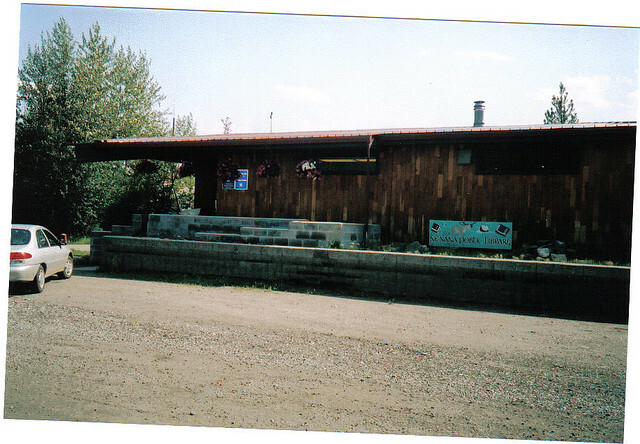 Case in point, the library at Nenana. 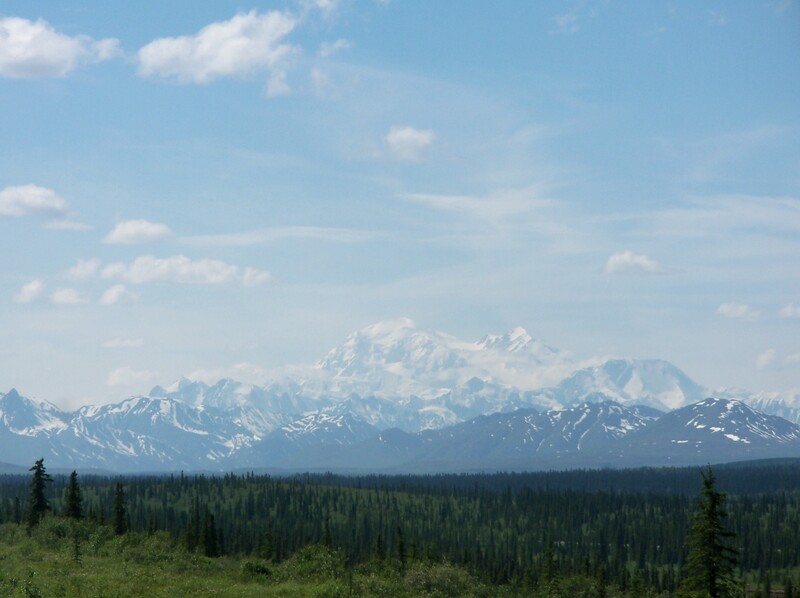 Sharry and I were riding, both with colds that were rapidly becoming worse, from Fairbanks to Wasilla. Our first day was 53.6 miles of uphill, 90 degree misery. It should come as no surprise that we decided to recover for an extra day at the Nenana RV Park. At breakfast I inquired about a library–truly, I did not expect one. Nenana is a town of only 400 people, and is isolated by nearly deserted highway for 60 miles in each direction. The town itself is peppered with boarded up buildings, and I don’t think there has been anything new built there for decades. The very streets were barren of cars, kids, dogs or any other signs of life–but for a lone raven, playing with a bit of tar paper that had come unstuck from an adjacent roof. But YES, there was indeed a library, and it opened up at 11:00! The prospect of lonely hours to idle away while we coughed, wheezed and sneezed in the tent receded into the distance, and our gloom lifted. There was indeed a book exchange, there were indeed friendly faces, and in looking at my email, I found happy news about a job I’d applied for. It was a long, hard, hot and hilly ride to get there, but bicycling to the library is one of my favorite activities, too.